Hacienda San Angel, an intimate boutique hotel overlooking Banderas Bay in Puerto Vallarta, Mexico offers a 2-night “Heavenly Escape” including a couples’ massage, sparkling wine, evening margaritas, breakfast in bed & airport transfers for $845 per couple. Twin Farms, (pictured), a stunning restored farmhouse-turned-luxe-resort in Vermont features a three-night Valentine’s weekend package including all gourmet meals, drinks, hand-dipped chocolates, a bottle of Dom Perignon & a couples’ massage. 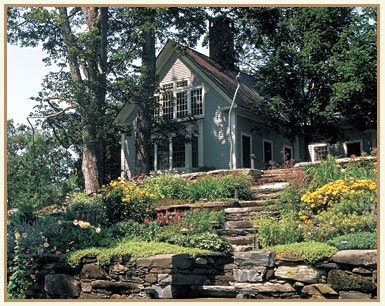 All-inclusive price of $7,400 per couple includes accommodations in a cozy, plush Farmhouse room. Plaza Athenee in the heart of NYC, pulls out all stops on Valentine’s Day with the booking of a deluxe balcony suite ($1,795/night). The one-night package includes a romantic dinner for two on private glass-enclosed terrace, a La Perla gift bag, V-day breakfast in bed, rose petal turndown, Champagne, roses, chocolate dipped strawberries & other special treats. Dunton Hot Springs, tucked away in Colorado’s San Juan Mountains, features a three-night Valentine’s Day getaway inclusive of three daily gourmet meals, a spa treatment of your choice, Champagne, flowers, chocolate-covered strawberries, and accommodations in a luxury cabin surrounded by Dunton’s mineral hot springs. Priced at $2,140 per couple, the weekend package also includes activities from snowshoeing to ice skating to cross-country skiing. Cabo Azul, an all-villa luxury hotel in Los Cabos, Mexico, features a five-night Romance Package for $1,759, inclusive of accommodations in a stunning 1,200 square-foot villa, a couples’ massage, chocolate strawberries, sparkling wine, and a romantic dinner for two. For the ultimate in romance, Paris is the place to be! We love the chic blend of classic style with modern design at Le Meurice, and the hotel’s “Pretty in Pink” package is made for Valentine’s Day. Priced from 580 euros/night, the package is filled with fanciful gifts like a bouquet of roses, pink petit fours, rose Champagne on arrival and upgraded accommodations. To book any of the above, or for additional ideas on luxury hotels offering romance-inspiring packages, contact Elite Travel International at 310.979.9036 or via email stacy@elitetravelinternational.com. Awesome list, really helped to find some best hotels. Someday when you visit Indonesia, escpecially Yogyakarta you can find the list of Hotel Murah di Jogja to save some money. We also provide car rental service to help you explore many tourist attractions, our company name is Sewa Mobil Jogja the best car rental service in Yogyakarta. Awesome list, really helped to find some best hotels. Terima kasih atas informasinya, ditunggu kunjungan baliknya.